The box included instructions, 16 different nail polish strips, a cuticle stick, and a mini file/buffer. The instructions say to find nail polish strips, out of the 16, that match the size of your nails. 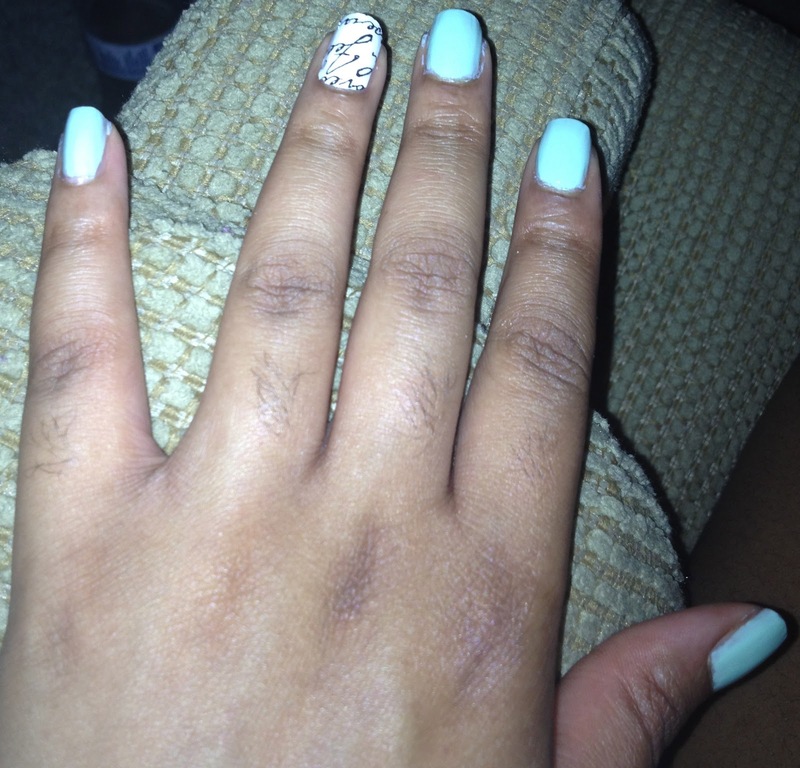 After, clean your nails off to get rid of any dirt or oil that may prevent the strips from sticking. Each nail polish strip comes with a plastic film attached to the sticky side of the strip and a tab on the end to hold the strip while putting the strip on the nail. The key to properly apply the strips is to get is as close to the cuticle as possible and to make sure the strip remains straight. 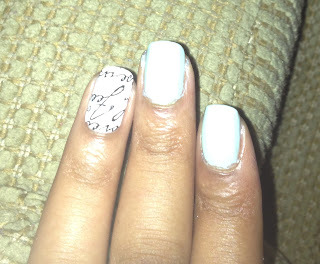 The cuticle stick is a big help for this step. 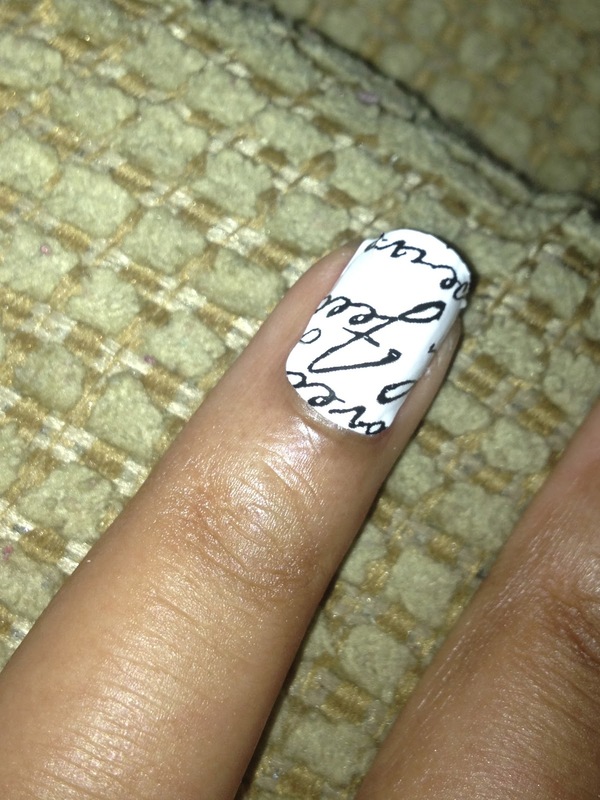 After getting the strip close to your cuticle, press and smooth the strip down. Make sure there are not any bubbles. After you are done smoothing the strip, fold the excess strip down at the tip of your actual nail and take the mini file and buffer off the excess strip material. I added a step by smoothing down the tip of the strip at the end of my nail. 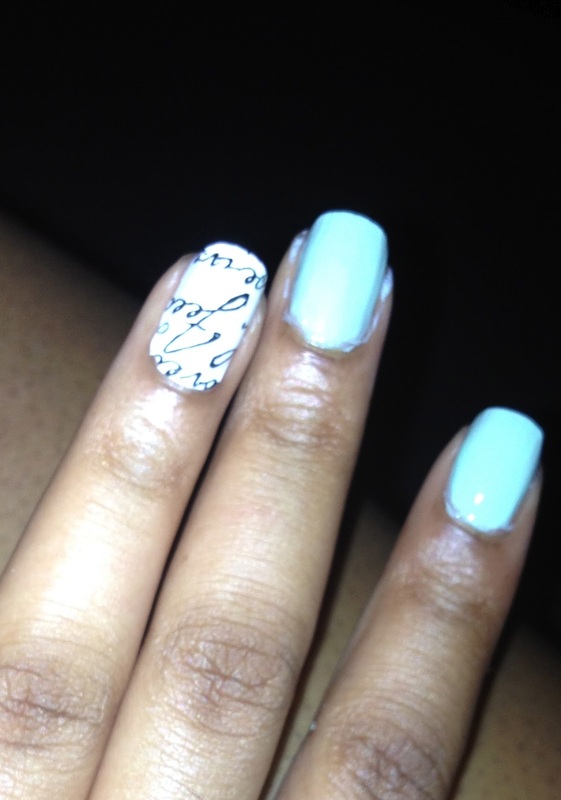 The strips are suppose to last for 10 days and can be removed with nail polish remover. 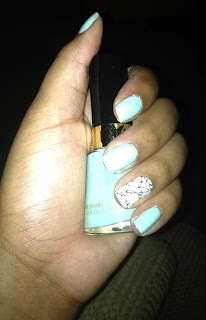 I decided to only use one nail polish strip on each hand and paint the rest of the nails using Revlon's nail polish in the shade Sassy (510). I loved the way it turned out. 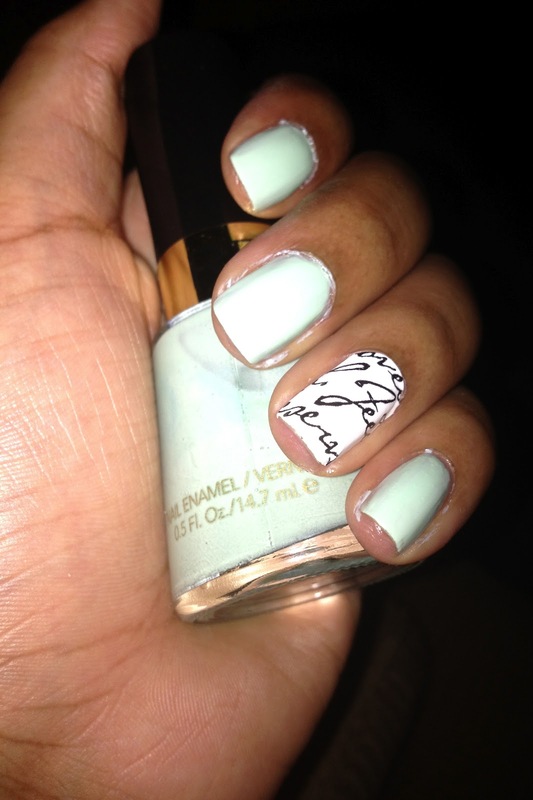 I think the white strip with the black letters and the minty nail polish color works together. I was surprised on how easy it was to apply the strips. It only took a few minutes (keep in mind I only used two strips). The strips lasted longer than the actual Revlon nail polish. The nail polish began to chip after about 5 days. The strips did a good job holding up for the 10 days, as promised on the box. Only one small corner of one the strips chipped on day 8 or 9. Other than that it lasted for about 11 days. I did make sure to do things like cleaning up and washing my hair before applying the strips and painting my nails (that always helps). Removing the strip was just as easy as removing any nail polish. I used a nail polish remover and a cotton round pad I normally use and the strips wiped off like the nail polish I painted on. The nail polish strips are suppose to be like the Minx nails that were hot for a while back in 2010/2011. 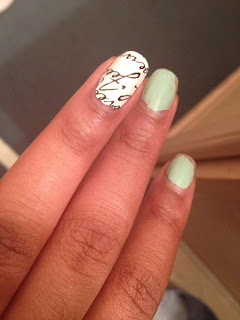 I actually like the strips better than getting the minx done professionally at the salon. Back in 2010 I decided to get minx on all of my nails on my hands and a regular pedicure. This ended up costing me $70 all together and the minx only lasted a few days. I bought these strips and applied them myself which only cost me $6 to $9 and lasted longer. 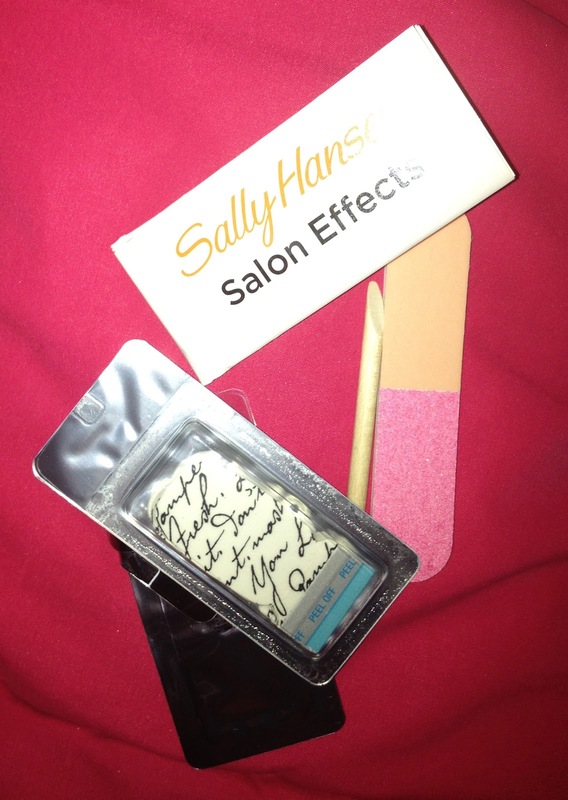 I am very impressed by the Sally Hansen Salon Effects Real Nail Polish Strips! I believe they are worth the price and time it takes to apply them. My only gripe is I wish they had more options available for patterns/print in my local stores. This can be kind of a big waste of product though because as soon as you open the silver package they come in, the other strips start to dry out. Good observation! I have not even looked at the strips again since I used them. I didn't know they could dry out even if they still have the plastic film on the sticky side. Good to know for future references!